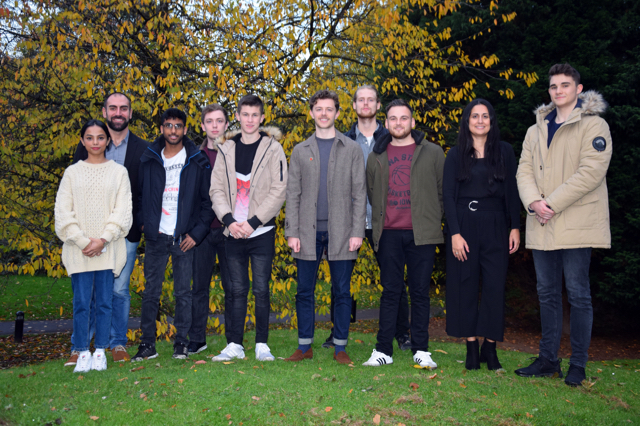 On Monday 5 November we welcomed our first intake of degree apprenticeship students onto the Civil and Infrastructure Engineering Degree Apprenticeship, offered by the School of Engineering. A degree apprenticeship is a job with training, where students gain and integrate practical skills and theoretical knowledge. On completion of the BEng Civil and Infrastructure Engineering apprenticeship, apprentices gain both a degree and a professional qualification (Incorporated Engineer) with a Civil Engineering professional body (currently the Institution of Civil Engineers). Degree apprenticeships are increasingly popular as they provide a tuition fee free route to higher education, whilst earning a salary. The course was developed to expand the portfolio of undergraduate offerings at the School of Engineering beyond traditional full-time, on-campus studies, to offer more flexible and innovative pedagogical approaches. Degree apprenticeships are of growing interest for the School of Engineering as a means of establishing new and long-lasting relationships with employers. “Our course combines the best aspects of higher education and vocational training. It was co-designed during 2017/18 by employers and academics from the School of Engineering, ensuring that graduates will develop the right mix of academic knowledge and practical skills to thrive in the workplace. The course is mapped to the Civil Engineer Degree Apprenticeship Standard published by the Institute for Apprenticeships”. The course also offers an alternative pathway to higher education for non-traditional students, thus providing an opportunity to get the most out of talented students of all backgrounds. It is an effective means of upskilling existing staff, providing genuine opportunities for career progression. The course is designed to increase productivity, improve service delivery and has a positive impact on staff loyalty. The degree apprenticeship is taught over five years and the students will learn whilst working in an exciting civil engineering role. Teaching at Warwick is delivered on block release, where apprentices take time off-the-job for intensive, one week periods of study at the University. Teaching is supported by distance learning through our state-of-the-art virtual learning environment. “The development of the course has been exciting and challenging at the same time. The hard work from all stakeholders has been rewarded by the enthusiasm and commitment of the nine apprentices starting on the course. I would like to thank the Degree Apprenticeships team in particular for their support throughout the development of the programme”. Employers participating in the 2018/19 course are Keller Group, J Murphy and sons, Peter Brett Associates, Mott MacDonald, and Balfour Beatty. There is an expectation of growing the intake number of apprentices to 50 in the next two years. The next Warwick degree apprenticeship course outside of WMG is expected to be a BA (Hons) in Social Work commencing in early 2019. Degree apprenticeships are a key part of the University’s new Education Strategy and any department who is interested in exploring the development of a degree apprenticeship programme should contact Sam Hardy in the first instance.